Brenda has been at the ranch for quite a while, with a variety of horses over the years. 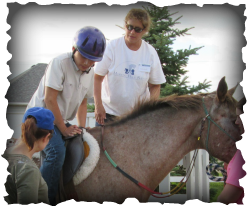 Brenda began working with our independent riders in the children’s program when we had just a few that had out-grown a regular class but were not quite ready to graduate. As the advanced class grew she began teaching one night a week both regular classes as well as one of the advanced classes. She is currently working on her PATH certification and will be certified in early 2017. She will be joining the Heroes on Horseback Program instructing Thursdays and continuing with the Wednesday evening Children's Program, as well as a back up instructor as needed. Laura came to Majestic Hills Ranch after working for several years with another therapeutic riding center. 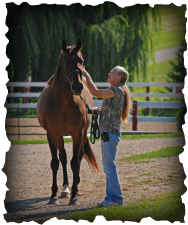 Her knowledge and willingness to help out all of our riders is greatly appreciated. She has since taken over the Monday evening classes and continues to work towards her certification. We are looking forward to helping her in this goal and to continue having her as an instructor.